Arch-criminal Tony Stone (Z’Dar), along with his underworld buddies Lynch (Diamond), Uncle Loony (Williams), and Jesse (??? ), pull off a heist, netting themselves a cool 150,000 dollars. But soon the law catches up to them and they are sent to prison. But before they go away, Tony gives the money to a mysterious woman named Stepmom. While en route to jail, in a classic prison transfer mishap (maybe they should just stop transporting prisoners altogether; it never goes as planned), the baddies escape. They go on the lam for a while and eventually end up at the house of the Morgan family. That includes father John, young son Brendan, plus a mother and daughter. The thugs hold the family hostage while they figure out a way to get their stashed-away money and go back out on the run. Meanwhile, Lt. Sunset (Brown) is on their trail. Unfortunately for the hostage-takers, papa Morgan is a hulking meathead in his own right and is a master kickboxer. Will he use his skills to free his family, as well as a doctor (Rescober) also taken hostage? Find out today! We’re huge Amir Shervan fans and we were thrilled to finally track down this “lost” movie of his. 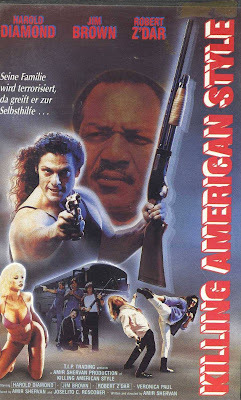 Killing American Style even uses many of the same locations as his prior masterpieces Hollywood Cop (1987) and Samurai Cop (1989) - the house where most of the action takes place, for example, and the restaurant where Matt Hannon gives his immortal speech in SC. He re-uses some of his stock company, such as Z’Dar, Rescober, and the kid that plays Brendan. He even recycles exact snippets of dialogue (“keep it warm”, “no, you shut up”, etc.) So to recap: the same actors, locations and dialogue as used previously - and we have only one thing to say: THANK GOODNESS! If it ain’t broke, don’t fix it, and our favorite Shervanities are on full display here. The synth score is also very similar, if not exactly the same as before, as well. Maybe that’s why KAS didn’t get widely distributed in the U.S. Perhaps video companies felt it was too similar to his earlier works. But perhaps Shervan should have stuck the word “Cop” somewhere in the title, because out of his three main works, this one is the weakest. But it didn’t have to be. The movie is on the long side at an hour and 41 minutes, and a lot of it could have been trimmed. Towards the midpoint, it slows down and loses momentum, and a Fear (1988)-style hostage drama needs all the pep it can get. Yes, there is a ton of silly dialogue, wacky line readings, off-kilter direction, downright misguided hair, amazing outfits, and all the things that make Shervan movies great, but he pushed it too far this time. But the length is really our only complaint. The movie is a great showcase for fan favorite Z’Dar, who gets a lot of killer screentime and seems to be enjoying himself as he chews the scenery to smithereens. Harold Diamond, last seen in Trained to Kill (1989) along with Zagarino, is on board as well, alongside Jim Brown, who seems to be sleepwalking through his role. More than usual. The unknown (to us, at least) actor who plays John Morgan was a nice discovery. As a meathead, and a dad, or meatdad, it proves you can still fight Fabio lookalikes at your local kickboxing gym at the drop of a hat and still be a good father to your son. In the 60’s, we had Love American Style. 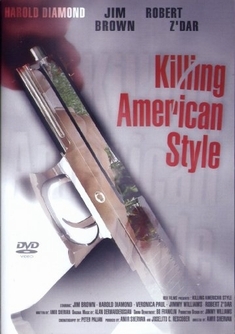 At the dawn of the 90’s, we had Killing American Style. Amir Shervan once again shows us the direction our society is taking. Fans of his two “Cop” movies will certainly find more of the same here, but non-fans might find the rarity of this film too daunting to try to track down. Also check out a write-up from our buddy, RobotGEEK! 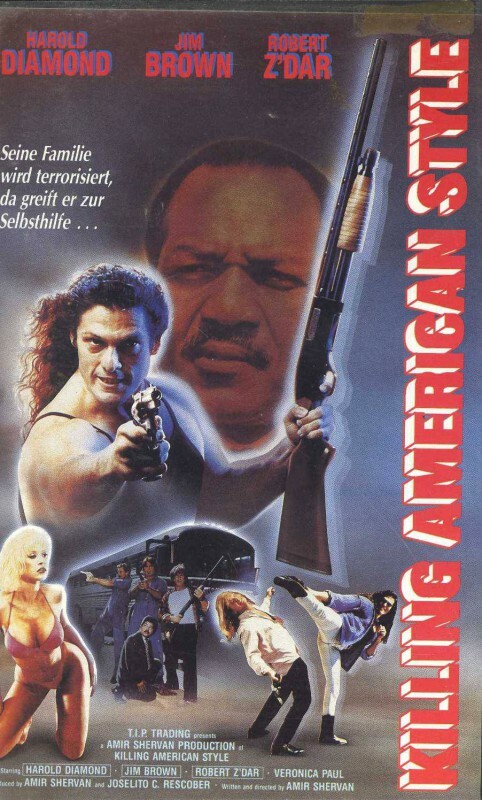 Damn, I had no idea Robert Z Dar was in so many films. BTW, how did you see this film? I can't seem to find it anywhere? Robert Z'Dar has been in so many weird movies...including this one, Samurai Cop and Run Like Hell. We found it on YouTube in the U.S...Hopefully it's still on there. Alas no, it is not. That is unfortunate...maybe it will be back on Youtube in the future...It's happened with other movies before...For example Final Score with Chris Mitchum was on there and then taken off...but now it's back on. Awesome! That's great you found them. Ha! You were right! Very similar take with both of our reviews on this lost gem. When I first saw Harold Diamond in Hard Ticket to Hawaii, I was like "who is this weird guy?". So glad he at least starred in one film before he gave it up. Nice review guys! Haha! Thanks! Got to love Harold Diamond. He should've made more movies.